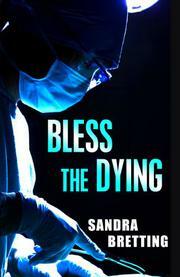 A suspicious death at a California hospital turns a public relations specialist into an amateur sleuth. Rhetta Day’s PR job at St. James Medical Center is changed forever when her college boyfriend Nick Tahari, now a police officer, is admitted in critical condition after an allergic reaction to the iodine used in a simple test. Although Rhetta and Nick once seemed destined for marriage, her horror, stemming from a childhood incident, of his becoming a police officer put paid to their relationship, and Nick eventually married Beryl, a coronary care nurse. As Nick’s condition worsens, Rhetta becomes convinced that this was no accident, but she has a hard time getting access to Nick’s medical records. Meanwhile, a power struggle seethes at the hospital’s top level, and a PR disaster looms when a doctor who’s reportedly on drugs removes the wrong kidney from a patient. People from Nick’s past who turn up at the hospital include a former fraternity brother who was kicked out of school after Nick stopped a dangerous hazing incident. One who doesn’t visit is Nick’s partner, who’s under departmental investigation but still working. Nick’s high school friend Dr. Eamon McAllister, a newcomer to the hospital staff, romances Rhetta, then admits he paid for medical school by selling drugs. When Nick dies, Rhetta is devastated but more determined than ever to find the truth. Ditsy Rhetta is neither believable as a sleuth nor compelling as a heroine in Bretting's (Unholy Lies, 2012) mediocre whodunit.